Audiqueen provides storage and visualisation of middle ear impedance measurements like tympanometry and stapedius reflexes. Typical screen showing the Y, G and B curves of the impedance measurement, and the stapedial reflexes as measured at different intensities between 80 and 110 dB (in this case ipsilateral reflexes). 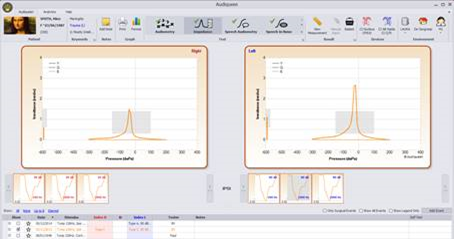 Audiqueen can connect to the most commonly used tympanometers and extract the measured tympanograms and stapedius reflexes and reflex decay automatically from the instrument. Please refer to the list of supported instruments. Figure showing how the measuring device is selected.